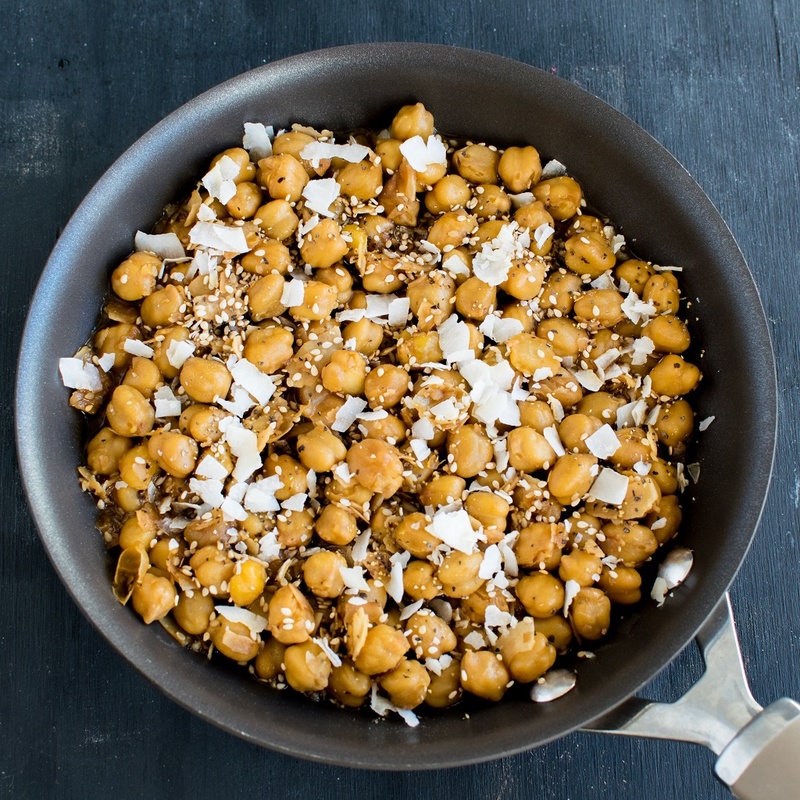 Garlicky Sesame Chickpeas with Coconut is a complete fusion entree with various flavors infused in one pan. When paired with steamed rice the dinner becomes even more desirable and wholesome. I personally love chickpeas not only because of its deliciousness but mainly because of its versatility. 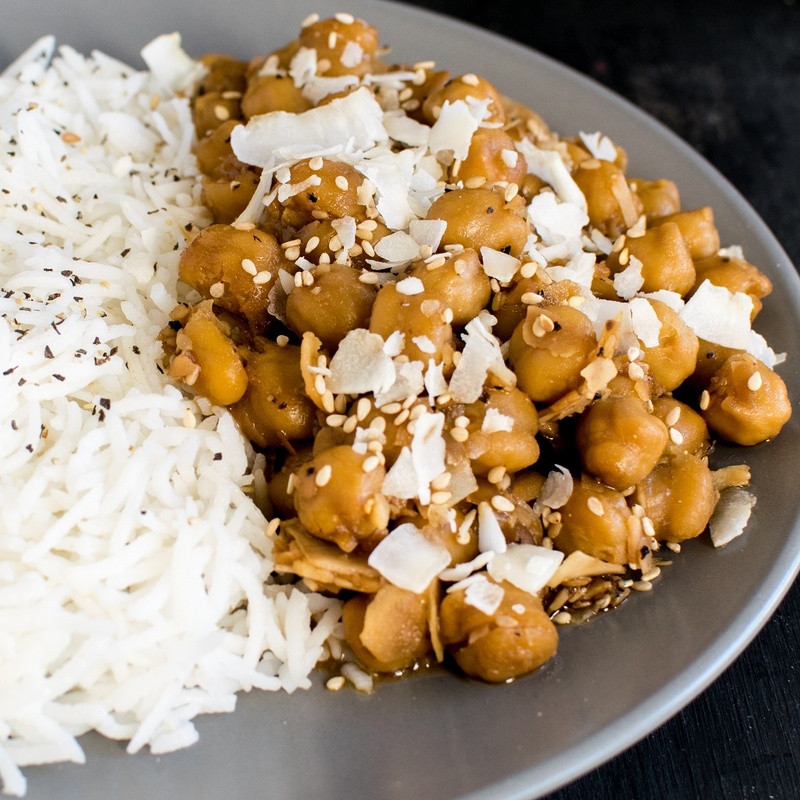 its easy to convert chickpeas into any form of recipe be it sweet or savory because of its texture and flavor. This protein rich ingredient tastes as delicious in every recipe and justifies any dish unquestionably. By the end of the week usually I am out of grocery and major food items. So I wanted to cook something quick with the little of what I found in my pantry and yet wishing for something suitable for my taste buds. I am fond of coconut so I always store some in my pantry. I combined garlic, white sesame seeds and coconut in a little oil. Voila! The aroma was unbeatable. It made me even hungrier and at that point I knew the combinations were perfect. However, my task to make it a winner dish was yet unfinished. By the time I tossed in the rest of the ingredients and served it with steamed rice I could not wait to take a bite. I hungrily finished my serving. My belly could not have been more satisfied and happier. 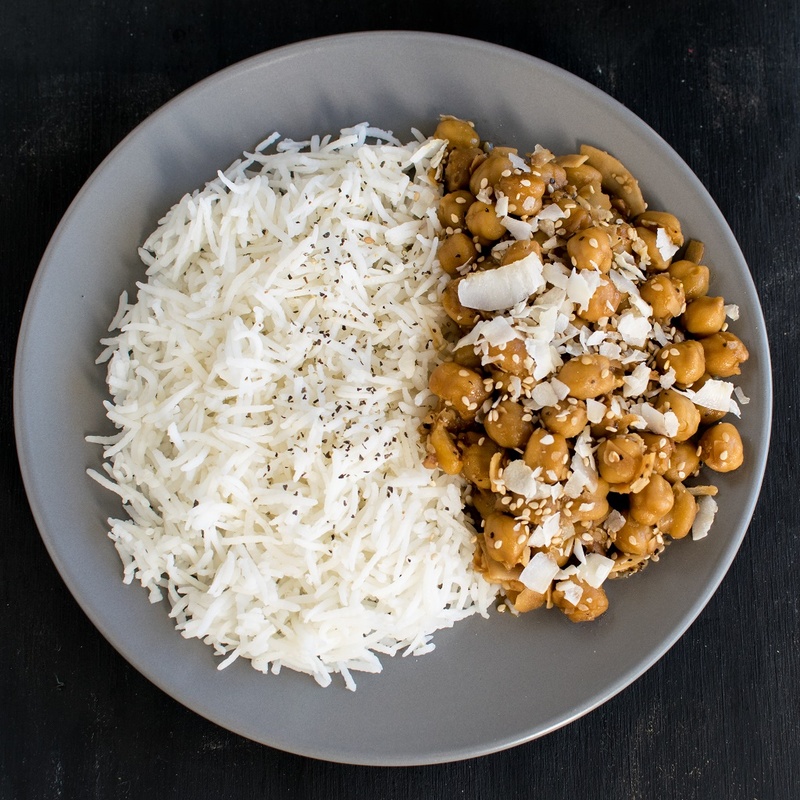 Eagerly, I served the same to my family and they enjoyed Garlicky Sesame Chickpeas with Coconut as much as I did. I knew I had to share this 15 minutes dinner with you because who doesn’t want a quick delish on their plate. Heat oil in a nonstick pan. Add garlic, sesame seeds and coconut. Sauté for 30 seconds on a medium flame. Increase the flame to high and add soy sauce immediately. As the bubbles of soy sauce forms lower the flame. Add vinegar, maple syrup, black pepper and mix well. Add chickpeas and aquafaba and mix. Cook covered on medium flame for 5-7 minutes or until its well-blended and chickpeas do not have raw taste. Do not let it dry. Slight liquid should float at the bottom to flavor the entrée. Lastly sprinkle salt as per your taste and serve warm with steamed rice. I use fresh homemade boiled chickpeas. Also I used fresh homemade aquafaba for this recipe. Aquafaba is the leftover chickpea water that’s used for boiling chickpeas/garbanzo beans. For us there was no need to add salt so feel free to sprinkle salt as per your taste. If while cooking the liquid dries up add about ¼ cup of water to chickpeas and cook covered at a low flame until water is well cooked. Adjust the spice a little before serving. Looks good! And I love QUICK dishes. This looks so good. I can’t wait to try this. This recipe looks so simple and delicious. 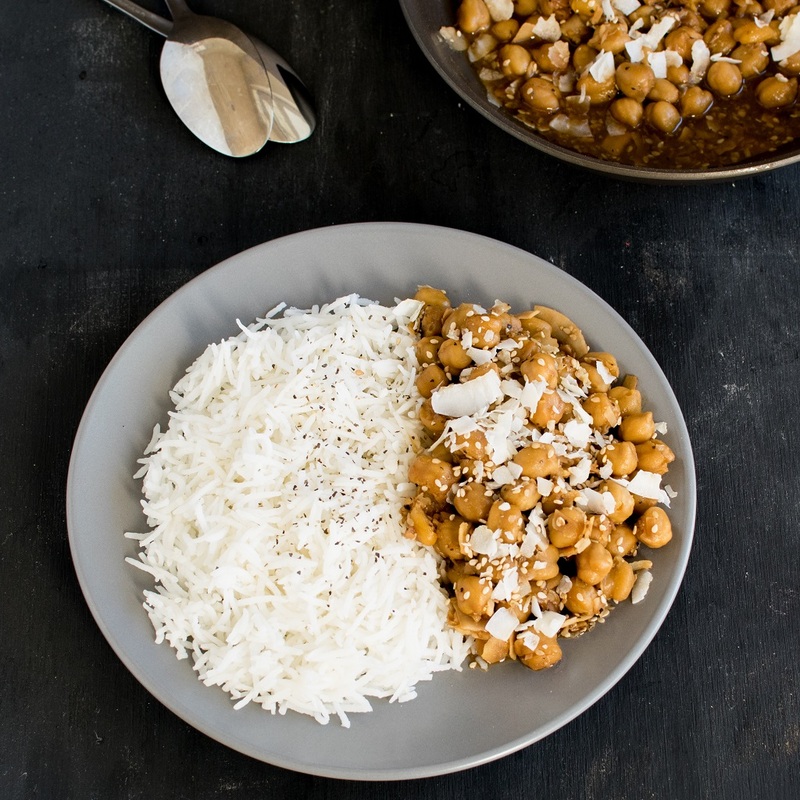 I need to try a new chickpea recipe so this is great timing. Thanks for sharing! Yum yum yum! What a great dinner idea! Love this dish! Anything that is quick, healthy, filling…and includes garlic (!) is a winner in my book! Yum! This looks like such a comforting bowl! I love coconut in savory dishes – YUM!